Here in Panda Free Games you can download more than fifteen thousand (15,000) full free games to play on your computer in offline mode (without internet). We were the first site in the world with this fast download system of Unity 3D games, 3D Shockwave games and Flash games, divided into various game categories. The system is simple and more than 90% of our online games will be available for download. But 100% of the downloaded games can be played online and offline (without Internet connection), using only the Mozilla Firefox browser. Make downloads of the necessary programs and then download our games with maximum speed. This whole process can take between 5-30 minutes depending on the browser you already use, but also your knowledge about downloads and web transfers, and also the speed of your current internet connection. But we guarantee you will be satisfied with the time invested, because once you download a game, you be able to play and download other games very quickly. 2 - The second step, is to create a new empty folder on your desktop, for where you can send all our downloaded games files. To never forget our site, you can assign the folder with PandaFreeGames.com name to this new folder created. 3 - If you don't have the Mozilla Firefox browser installed on your computer, you must download/transfer this browser to your compute ror MAC http://www.mozilla.org/firefox/new/ and then complete the installation of it. Choose also to put an immediate shortcut for this browser on your desktop. This shortcut on the desktop will be indispensable to a step that will follow later and this is the unique browser that lets you play this games offline. Information note: In Internet Explorer and Safari you can only play 60% of our games and the Chrome browser not allow the execution of Unity 3D and 3D Shockwave games. Because of this, Mozilla Firefox is now growing significantly in the number of worldwide users. 4 - But first, if you can not play these games online, also can not play offline. Therefore, this page already has to be read using the Mozilla Firefox browser. Check now if using Mozilla Firefox you can play all our games, one of our Flash games, one of our Unity 3D Games and one of our Shockwave games. This because, even if you have already installed these plug-ins and played all these kind of games, if you have already played this games but in another browsers such Chrome, Internet Explorer or Safari, this necessary plug-ins were probably installed inside the other browser you used before and not in the Mozilla Firefox. The game pages have the necessary help to play all of our games using Mozilla Firefox. 5 - In the game page, if the game is available for download, you will find the button/image to access to the final download page. 6 - In the final download page you can find a text link that you will use to download/save the game on your computer. Use the right button of your mouse for this action. Do not forget to save the game in the new destination folder you created on your desktop with PandaFreegames.com name. 7 - The game is already on your computer in the new folder you created PandaFreeGames.com and if you want, right now, you can change the name of the game/file you downloaded to the real game name or any other name you want to assign. But how open the game file which you downloaded? Nothing easier, you can use the Mozilla Firefox's capabilities even without internet (offline). Step A - Click with the right button of your mouse on the downloaded file/game on your computer. Then, depending on your version and language of Windows, there is a similar option to "Open With >" click it. Step B - Then another option (should be the last) with an identical name to "Choose default program ..."
Step C - When performing this action will open a list of installed programs on your computer and more below find a text with a name identical to "Always use the selected program to open this kind of file" and the box next to this phrase it should be selected with a check to not have to repeat this process to open this game and other games of this type. And the right of this text, there will be a button with the same name "Browse ...", click this button. Step D - Then, find and click on the left menu the Desktop icon/button, after click it, at the right will open all folders, icons andexisting files on your desktop. If you did what we indicated above in point 3, on this master list you will find the image/icon/button of Mozilla Firefox shortcut that will need now to select it to open the file/game. Now to open again this game or other downloaded games, if you selected the box with the identical phrase: "Always use the selected program to open this kind of file", now you can open this kind of files/games with a double-click on transferred file, you don't need to repeat all the opening steps explained above. But beware, there are three different types of games on our website (flash, shockwave and unity) and therefore also three different types of files, in case of performing the download of a file type, you may have to repeat this process for the two other types of unopened games on your computer, always using this method. When performing this action for these three different types of files, you can open all three types of games with only two clicks on the downloaded game file. Now, you can make a download of any game very fast and play the game without internet connection will be even faster, with only two clicks. 1 - By downloading, run and install successfully the 4 plug-ins (Adobe Flash Player, Adobe Shockwave Player, Supplements Adobe Shockwave, Unity Web Player) in Mozilla Firefox, now, for sure, you can play and download all of our games that are available for download. But attention, in the game pages the help texts with links to Plug-ins downloads, will only begin the transfer/download or save the installation file on your computer . After the transfer is fully completed, you should open the downloaded/saved game/file and follow the steps to run/install on your browser these transferred Plug-ins. The transfer/save/download of the file will never be enough if you do not start and complete the implementation and installation of this plug-in downloaded/saved. 2 - After complete successfully the download and installation of plug-ins, there might be alerts of blocked plug-ins and authorization to run them , you should always give authorization/permission for these to run. You can also choose to manually activate the "Adobe Flash Player"; "Shockwave Flash" and "Shockwave for Director" of Adobe Systems Incorporated and the "Unity Player". In the Mozilla Firefox browser, to manually activate these plug-ins in, open a new tab of address bar/url website and type or copy and paste to the address bar/url the following text about:addons and then access it as you visit a normal website, to find Plugins and activate the Plug-ins listed above. After enabled/activated, reload the game page. Games with excellent 3D graphics to play and download fast and direct. The games are also available to play online before download. These games require the transfer/download and installation of Unity Web Player to can be played online or offline. Games with 3D graphics to play and download, fast and direct, download while you play or after play. In shockwave games, about 30% of games are not available for download. These games require the transfer/download and installation of Adobe Shockwave Player and supplements to be played. The main games from our website, 90% of this games are available for download, before playing, while you play or after play. They can be found by game categories. You need to download Adobe Flash Player to play these games. There are many games inserted into numerous subcategories games on our site, for those who want thousands of games on your computer ready to play offline without internet. If you want, you can also access to these games directly for the following game link computer games where you will find the paging for all subcategories of flash games on the bottom of that page. You need to download the Adobe Flash Player to play all this flash games. To be able to play all the games, you have to use the Mozilla Firefox browser and installing the plug-ins with Mozilla Firefox. The Unity and 3D Shockwave 3D games are no longer supported by Chrome (browser), only flash games can be played with Chrome browser. If you wish to play all of our games, we recommend you to use Mozilla Firefox browser and a quick installation on this browser of all the necessary Plug-ins to play, such as Adobe Flash, Adobe Shockwave and Unity Web Player (more below you can get all direct links for download/install). If you can not play a game, we will try to give you a solution not only to play this game, but all games from our website, as well, all other games of other websites around the world, so it's good you lost some minutes with this explanation and installations, because the advantages will be many to the navigability on the web/internet. Now, copy the address/link /url of this page which you are at the moment for a written document of your computer as Word, Excel or Notepad. If you copy the link/url directly from the address bar, then you can return directly to this page after some necessary installations that you might have to do in external websites. All links and downloadable programs that will be linnked here are 100% safe, from prestigious companies such as Mozilla Firefox, Adobe, Java and Unity. The game loads, the game opens, but it is cut! The playing area of any game may be cut off if you don't have the zoom of your browser at 100% (Chrome, Mozilla Firefox, Internet Explorer, Safari ...). To find the Zoom option, go to the top menu of options, Chrome or Mozilla Firefox , Internet Explorer or Safari . Not have the patience to find the specific problem of why you can not play? Then opt for a radical solution that we suggest you, install in your browser all that is needed to play all our types of games (Flash, Shockwave and Unity) not only on our website but in all other gaming sites around the world. All links and downloadable programs referred here are 100% safe from prestigious companies such as Mozilla Firefox, Adobe, Java and Unity. But beware, all these links of programs needed to play, can only start the transfer/download or save the file (Plug-in) for installation in your browser . After the transfer is complete , then find the downloaded/transferred file and click it to continue and complete the installation of downloaded Plug-in. To play all the games, only it's possible with Mozilla Firefox, if you are using it, visit this same page with Mozilla Firefox, if you do not have Mozilla Firefox on your computer, you can install here http://www.mozilla.org/firefox/new/ for computer and MAC Apple, but first make sure that you have copied to a text document (like word, Excel, notepad) the address/url/direct link to this page to be able to come back here directly. Even if you have already installed some of the Plug-ins such as Flash, Shockwave or Unity with another browser, these will always have to be also installed in Mozilla Firefox, with/using Mozilla Firefox. To play all our games Flash games install Adobe Flash Player http://get.adobe.com/flashplayer/ directly in your browser (MAC Apple use another link: http://get.adobe.com/flashplayer/otherversions / ). To play our games Shockwave install Adobe Shockwave Player http://get.adobe.com/shockwave/ directly in your browser (on Mac use another link: http://get.adobe.com/shockwave/otherversions/ ) after that installation you can choose to install the supplements of Shockwave with http://www.adobe.com/go/sw_msi_installer on computer, for Apple Mac in http://www.adobe.com/go/full_shockwaveplayer_macosx. This supplement will make 100% of Shockwave games work on your computer, however, do not be surprised if at the time you give permission for the installation does not continue for a few seconds/minutes, will be normal if this happens, also, to complete this transfer without interruptions during the installation, if you have an open web page with a shockwave game ready to be loaded, you may need to close the web pages of your browser to be able to continue the installation, so, again, we recommend you copy the address/url/link of this page and paste into a written document of your computer such as Word, Excel or notebook, to be able to return directly to this page after the installation. After all transfers and downloads, reload the game page. Even after all the actions the games do not work! 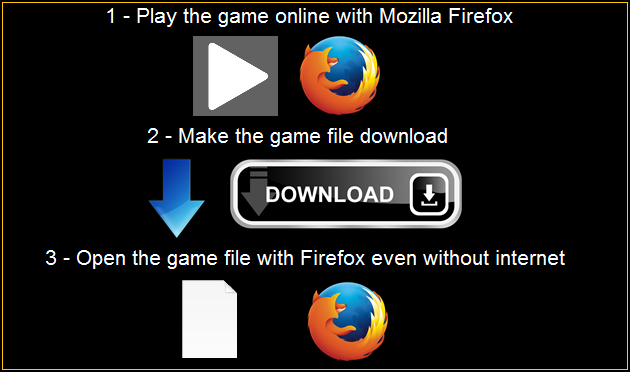 If you are using Mozilla Firefox and completed all the above transfers using this same browser and then successfully installed all the files (Plug-ins) transferred, then you have to be able to play all of our games, except if there is a temporary problem with this game or any incompatibility of this game in particular with your computer. Try to play other games of the same type and if this other games also do not work it's because any Plug-in was not properly installed in your browser or they are being blocked and will only have the enable/activate this Plug-ins. For this, while trying to loading the game check up next to the address bar, if they are not being blocked some Plug-ins that you should permit/authorize the execution of those Plug-ins. But these warnings may not appear unless you have Java installed on your browser, but can also choose to manually activate the plug-in of flash games: "Adobe Flash Player" or "Shockwave Flash" from Adobe Systems Incorporated; Plug-in games of Unity: "Unity Player" or Plug-ins Shockwave: "Adobe Shockwave Player" or/and "Adobe Shockwave for Director" of Adobe Systems Incorporated. To authorize/activate manually these plug-ins, is very simple, in Mozilla Firefox browser open a new tab address/url website and type or copy and paste to address bar/url the following text about:addons . Then visit this text as you access to a normal website, go to Plugins and there you will find Plug-ins referred above and just have to authorize/activate the execution of each Plug-in. Once activated, reload the game page to load the game. But if this Plug-ins are not in the list, then, for sure, you not successfully completed the installation of the necessary plug-ins in the browser. But if you are sure you made the transfer of all these files but not sure that you have installed them properly, see all transfers made on the browser and then run all the latest files transferred to complete the installation of all downloaded programs. After the installation of all downloaded plug-ins, reload the game page and if the game does not work again go to about:addons Plugins and verify if the Plug-ins are already installed and appear as active/enable, when they are, reload again the game page. A refreshed website thinking about the user/visit, at the beginning there were only flash games then came Shockwave, then Unity, then come the games for mobile, tablet and smartphone devices (cell phone/mobile phone), starting with games for Android and now now for iPad and iPhone, Microsoft Windows Phone (Nokia and Lumia) and alsoBlackBerry, finally html5 games for all World mobile devices to play online without download. This site is also now 100% optimized for all mobile devices.Panda Free Games is a website originally created in portuguese, with automatic translation to english using web tools but always with human revision and manual text insertion. Have Flash, Unity and Shockwave games to play online on PC Computer and for download on Android Tablet and Smartphone/Android Phone on Google Play by applications (apps/apk), iOS iPad iPhone, Windows Phone and BlackBerry. For ages from 4 to 99 years old, from children (kids boys and girls) and adults.Free Games to play online and download games at Panda Free Games! This website guarantees entertainment and lots of fun for many years for all children, adolescents and adults. Games for all ages, from 4 to 99 years, the games are for everyone. Here you can play and also learn playing, this is Panda Free Games, the best entertainment site where you will find the funniest free games from across the web to play for hours and to come back every day. Already more than 15,000 games available to play online or download for Android. The boys prefer Car Games and kids prefer Children Games but all the other games are also great, the best you’ll find. Play here and now the best free games available in Flash, Shockwave and Unity, if you don’t have any programs installed on your computer, the link to the installation will appear on the game page. For those who enter for Android (tablet or smartphone) there are too many games to download directly through Google Play, also for iOS iPhone and iPad on iTunes, for BlackBerry in BlackBerry World and Windows Phone on Windows Phone Microsoft store. The fun is such that the doubt is where to start, but we have the solution, play today and come back tomorrow, and play tomorrow and COME BACK ALWAYS!Play Free Online Games! The latest free flash games to play online added to this website. Come to play the best free flash games from all the web. We have the best selection of those who we consider the TOP of web games and we also have our own games to play here without stopping. What are you waiting for? Come to play for several hours, games of many categories, games in Flash, Shockwave, Unity and even download games for Android tablet. Thousands of games you will find and everything here is 100% free and only do not play who do not want. YOU WANNA PLAY? So...PLAY NOW...non-stop playing! In short, many games for full fun for many hours. On this site with Panda always at your side, you will only find games, it is in our perspective the best site worldwide in the promotion of productions of different technology creative companies from all over the world. One of the oldest sites for online fun, founded in the year 2000, is also one of the largest in the world, being almost 20 years adding games every week. It was originally developed in Portuguese, it was later translated into four other languages: ENGLISH, Spanish, French and German. Initially had only, games for PC computer with flash technology and later we were the first in the world to add also free games for mobile devices, first with applications to download, both for Android and for iOS , iPhone and iPad, and then to play online without downloading apps on smartphone (mobile / cell phone) and tablet. For total satisfaction of our visitors and provide them with the best user experience, and like everyone else, we will always try to achieve the greatest success possible. Please make stop AdBlock to continue visiting the best games site in the world. All advertising on the site is from Google, 100% safe and easy to identify. Have you already paused AdBlock for this site?